Cape May is a year-round destination. Here are the most common questions we receive from people planning a visit to Cape May. During the summer, finding parking places in Cape May can be exasperating. The center of town collects much of the traffic and has limited free parking spaces. Most spaces are metered. The good news is that no matter where you park in Cape May, you're probably no more than a 20-minute walk to the center of town. Please see Parking & Getting Around for parking information. The best way to see Cape May is to walk through town. Cape May is a small island with so much to see that walking is the best way to explore. Of course, if you want to take another mode of transportation, that's okay too! Biking in Cape May is a favorite pasttime among visitors and locals, and one of the easiest ways to get around town. Local bike rental companies that offer daily or weekly rental periods and can even deliver the bikes to your hotel or B&B. The Great American Trolley Company offers free Park & Ride service to the Washington Street Mall, beach, and promenade, and one-way trolley rides in Cape May. Please see Getting Around Cape May for more information. How far is the mall from the beach? It's about 0.2 miles from the Washington Street Mall to the beach, or about a five-minute walk. What are the store hours on the Washington Street Mall? All of the shops in Cape May are independently owned and operated, so they open and close at their discretion. From mid-June to Labor Day, most stores are open 10am–10pm daily. After Labor Day to late October, most are open from 10am–5pm with longer hours on Friday and Saturday. Some stores are seasonal and close for the winter or are open only on weekends. 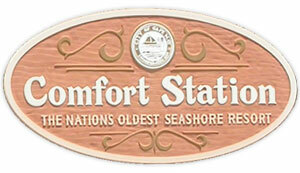 Cape May's public restrooms are called "Comfort Stations" and may be found on the Washington St. Mall and Washington Commons, as well as along the beach and promenade. These are heated/air-conditioned buildings with running water and soap, and electric hand dryers. Mall "Comfort Station" Locations are always open, year-round. Beachfront locations are open from 7:00 a.m. to 10:00 p.m. In season, they open approximately 6:30 a.m. There are no public locker rooms or shower facilities, but there are open showers located along the beachfront that allow you to wash away sand. Sometimes people wonder if there might be a low-cost motel near the beach where they can rent a room for a few hours. Unfortunately, even the most affordable motels on the island have minimum-night requirements during the summer, so this would end up being a very costly solution. If you are a daytripper and plan to spend the day on the beach and then head to dinner, more than likely you won't be able to take a full shower and change. There simply aren't facilities for that. We would recommend removing as much sand as possible with the outdoor showers, throwing on a cute coverup, and enjoying your evening regardless! Acme Markets is located at Lafayette & Ocean Street and is open year-round. There is a full-size Acme, with a liquor store, in North Cape May, and ShopRite and Aldi in Rio Grande, just off GSP Exit 4. The nearest Sam's Club is in Pleasantville, outside Atlantic City, roughly 45 minutes away. The nearest Costco is located in Stafford Township, about an hour and a half drive, north of Atlantic City. We'd recommend scheduling these stops into your drive down. Where is the nearest hospital or urgent care? For medical emergencies, always dial 9-1-1. To report a power outage, call Atlantic City Electric at 1-800-833-7476. Internet and cable are provided by Comcast and Verizon. Recycling is handled by the Cape May County MUA. If you can't find the answer to your question, please get in touch with us. Cape May is a year-round destination, but every season is different. Here, find things to do in any season, as well as average air and water temperatures. Ahh, Spring. Can’t you smell the sweet fragrance of hyacinths in the air? Don your Easter bonnet and take a stroll in the Easter Parade. Make sure to book your Easter Sunday dinner reservations early. Other than Mother’s Day and Valentine’s Day, this is one of the busiest restaurant days of the year. Be sure to join us when we tip our hats to the tulip as Cape May hosts the Spring Festival – the Spring Victorian & Tulip and Garden Festival. Then, before you know it – it’s Memorial Day Weekend – the lifeguards are on duty, every day gets busier and busier, warmer and warmer. Do you love food? The first week of June is Cape May Restaurant Week, an eight-day culinary event offering fixed-price dining at Cape May's best restaurants. The hustle bustle of summer is a few weeks away, so use this time for a quiet walk along the promenade at sunset or ride a bicycle down to Higbee Beach to watch the sun rise or set. Shops and stores that close for the winter open their doors on weekends and some full-time. The average monthly temperatures in the spring are 60ºF in April, and in May it get to be as warm as 69ºF. We all can't wait for June when it is finally warm enough for the beach! June's average temperature is 78ºF. Average water temperatures are 48-68ºF. Summer is, without doubt, the most exciting time of the year in Cape May. The area offers visitors any number of activities from whale watching to sport fishing. Cape May plays host to the The MidAtlantic that "boat to boat" is the richest and largest Marlin –Tuna contest in the world. The Nature Center of Cape May as well as the Cape May Bird Observatory offer programs and tours everyday in the summer. Of course, the usual activities are at your finger tips – the beach, bicycling, and walking. You can park your car and bike or walk around the island. In fact, If you're coming to Cape May for the first time, make a stop at the Welcome Area of the Transportation Center (where the buses go) off Lafayette Street across from the Acme shopping center and pick up a guide map on a "Car Free/Care Free" vacation. Volunteers from the Mid-Atlantic Center for the Arts (MAC) and the Chamber of Commerce are ready, willing and able to familiarize you with your new surroundings and let you know what’s going on in town during your stay. Shops and stores open early and close late. The average temperatures in the summer are 78ºF in June, 84ºF in July, 83ºF in August and 77ºF in September. Average water temperatures are 71-73ºF. Don’t think that because it’s Labor Day you have to pack away your sandals and shorts. There’s plenty of fun to be had in Cape May in the fall. If you like change, just stick around, the fall months offer lots of weather-related changes from 90-degree beach days to crisp fall evenings. In addition, the Calendar of Events for September, October and November is plum full of things to do. Just to give you an idea: You can attend the Food and Wine Festival and Jackson Street's Oktoberfest in September, or the Lima Bean Festival in October. And don’t forget the Cape May New Jersey State Film Festival. Did you know that Cape May Point offers nature lovers one of the most spectacular spectacles of nature available? The Bird Show, sponsored by the New Jersey Audubon Society, celebrates the fall migration of thousands of species of birds, butterflies and raptors. Participation is as easy as bringing your binoculars or you can sign up for the many seminars, nature walks and lectures offered. Cape May Restaurant Weekend, a scaled-down version of the annual June event, takes place from Thursday through Sunday sometime in November. The Mid-Atlantic Center for the Arts, (MAC) which hosts many of the historic tours of Cape May throughout the year, sponsors Victorian Weekend, celebrating all things Victorian in which many historic home owners open their doors to give you a peak of the past. MAC also sponsors the Holiday Preview Tours held toward the end of November. Visitors can get a head start on their gift list while celebrating the Victorian lifestyle. Most restaurants are open through the fall, though some may have reduced hours mid-week. Christmas is the loveliest time of the year in Cape May. The town is dressed up in its finest Victorian splendor so visitors can get a glimpse of a Dickensian Christmas - Cape May style. Speaking of Dickens, the Mid-Atlantic Center for the Arts (MAC) hosts a "Dickens Christmas Extravaganza" in early December. Participants can enjoy the tastes, scents, and smells of the Dickens’ era. MAC also sponsors the 34th Annual Christmas Candlelight House Tour – a must see. The West Cape May Christmas Parade evokes the pleasure and the joy of small town life. The parade is scheduled for the first Saturday every December. And make sure you pencil in Cape May’s tree lighting ceremony and community caroling as well as hospitality night when the Washington Street Mall merchants open their doors and offer shoppers a treat and a beverage as they hurry to finish their Christmas shopping. Speaking of shopping, stop by Winter Wonderland at Congress Hall during December for outdoor shopping stalls, food and drink, and even a carousel! Special events are also offered for children. Don’t think the fun has to end with the New Year bell ringing. January, February and early March are great times to plan that romantic getaway you’ve been talking about. Many of the hotels and B&Bs that remain open offer specials which often include a trip to the spa, a massage or a free dinner wrapped up in the package. Most shops and restaurants are fully open right around Christmas. After New Year's, several will close for a few months, but there are year-round restaurants in Cape May. The average monthly temperatures in the winter are 47ºF - 42ºF during December, January and February. March climbs up to about 51ºF. Average water temperatures are 42-37ºF.